His nomination is given below. Nominated by Sheila Chapman, Great Britain, seconded by Everett Leeds and Josie Hulbert, Great Britain. 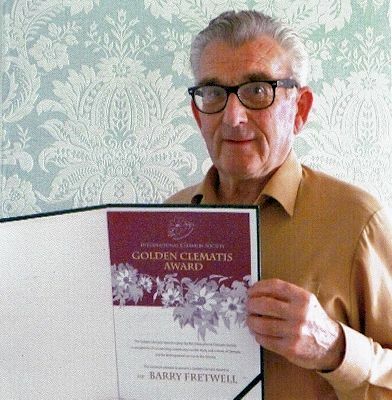 "As a member of the International Clematis Society I would like to propose that Barry Fretwell receives a Golden Clematis Award for his outstanding contribution to the World of Clematis. His hybridization program has produced over 35 clematis including C. 'Arabella' and C. 'Princess Diana', both exceptional clematis. Fortunately he is still hybridizing so we have much to look forward to." Mr. Fretwell has close on 50 years of Nursery experience as one of Britain's foremost Clematis Hybridizers, working at Peveril Clematis Nursery, Christow, near Exeter. He has raised more quality hybrids than any other breeder since the 1900's. Having closed the nursery to direct sales, he now concentrates on supplying new cultivars to Germany and Canada. His plants are known and appreciated in many countries throughout the World. He has written two books, the first on Clematis and the second on Clematis as Companion Plants, both being relevant today but especially the second book when using clematis with shrubs, roses, trees and other plants. His contribution has been appreciated by professional growers and amateur gardeners alike.